is staffed 24hrs. 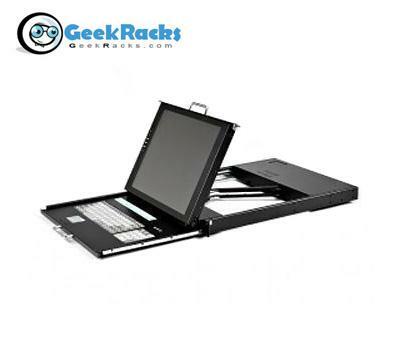 (upon request) with technical service reps."
The Geek Racks 15" KVM console drawer combines a 15" LCD monitor, a keyboard, and a touch-pad mouse with 8 KVM ports to allow management of up to 8 PCs! This Rackmount solution is perfect for small to medium companies seeking a solution for making IT management easier and more efficient. It works with any industry standard server racks and cabinets such as Kendall Howard,Tripp lite and ect. Geek Racks are built with the IT professional in mind. They are inexpensive in order to offer that balance between low cost and high quality. They are built to the highest standards of server rack enclosure construction, and will last for years, through even the toughest abuse. Geek Racks has a full range of server rack accessories and server rack equipment available to achieve any rack mount server configuration desired. Their tower server racks can be expanded upon or turned mobile in a matter of minutes. Accessibility is a breeze with quick-detach side panels and doors, and a Geek Racks specialty is the cooling system: keep rack mounted servers cool in any climate with multiple fans and cooling vent availability. 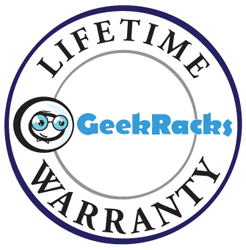 Don't compromise; let Geek Racks put you in command of your IT hardware. Racks2You.com is an industry leader in high quality server rack equipment. We offer an extensive variety of products, some of which are exclusives. We also offer customized technical support. Our tech support hours are 9am-9pm EST, but if you are making an installation outside our normal hours, call us and we will alter them and make a technical assistant available to you. How many other companies alter their hours for customers? At Racks2You, the customer really is our top priority. Our products ship out from our Florida warehouse within 1-2 business days helping you get the server rack equipment you need, when you need it!